Linda Burton posting from Annapolis, Maryland – “I’m definitely celebrating today,” I confided to the woman beside me on the bench. We were waiting for a table at Miss Shirley’s, where you couldn’t stir the brunch crowd with a stick and most of the conversations were celebrating football wins. She was from Savannah; her brother lived in Athens; she was beaming about Georgia’s victory over Tech; 41-34. Her husband, who was graciously standing so I could sit, was from Florida; he was equally pleased with FSU; Seminoles 37 – Gators 7. I’d watched Saturday’s football too; not the least concerned that the Crimson Tide would do its usual thing, and win the Iron Bowl. But, in the craziest ending in the history of football, a last-second 100-yard run by Auburn’s Chris Davis put a different result in the record books; Auburn 34 – Alabama 28. A shocker, yes; but even that couldn’t dampen my mood this week; I’d been overjoyed since Friday and that was that. I moved the conversation from football to the reason for my happiness. “Annapolis is my 50th! I made it! I actually frigging made it to all 50 capital cities!” This brought a puzzled look; I handed her a card showing my name and website address and went on to explain the Journey, the research, and the cats. “Well that is awesome,” she grinned, just as their table was called. “I didn’t get your names,” I said as they walked away. “My name is Joy and this is ….” was all I heard as they rounded the corner. My table was ready shortly; I settled in and ordered a Spicy Shirley like I’d seen up front; holiday red; unbelievably huge. 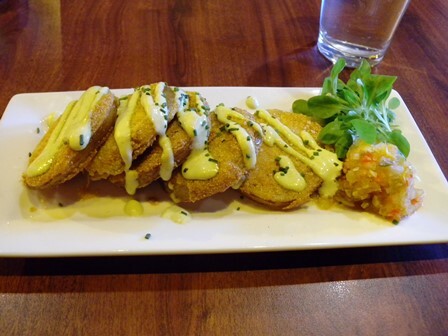 A couple soon was seated to my right; another to my left; my Fried Green Tomato appetizer arrived; the party was on. My Spicy Shirley was a virgin; I was more interested in vegetables than in alcohol, and it was loaded – a pod of pickled okra, a slice of green tomato, pepper strips and jalapenos, slices of lemon and lime, a Peppadew (which was unfamiliar to me), and a tender stalk of leafy celery; the veggie array occupied the entire width of the glass. I (later) learned the rim was edged in Old Bay, a seasoning mix produced in Maryland. It is named for the Old Bay Line, a ship of the early 1900’s that sailed the Chesapeake Bay from Baltimore to Norfolk; Gustav Brunn started the company, selling his spices in a unique yellow can. It’s regionally popular for seasoning shrimp and Maryland crab; but it’s also used as a topping on salads, eggs, fries, corn-on-the-cobb, boiled peanuts, and Bloody Mary’s. 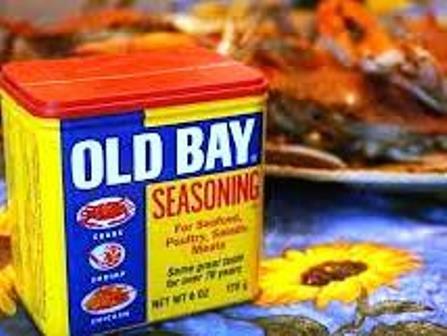 Old Bay Seasoning is common in Navy ship galleys; the US Navy, you know, has a large presence in the Bay area. I’m glad to discover it, and will make it a staple in my house hereafter. The seasoning mix includes mustard, paprika, celery salt, bay leaf, black pepper, crushed red pepper flakes, mace, cloves, allspice, nutmeg, cardamom, and ginger; there are 18 spices in all, still sold in the yellow can. As to that Peppadew; it’s a “sweet piquante pepper” grown and processed in Tzaneen, a small town in the Pompopo Province of South Africa. 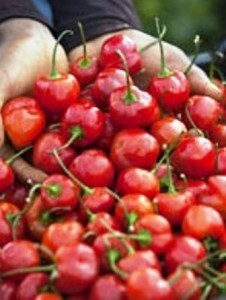 It looked like a small tomato; it was sweet like a cherry; another thing learned at a Sunday brunch; another joy added to my list. 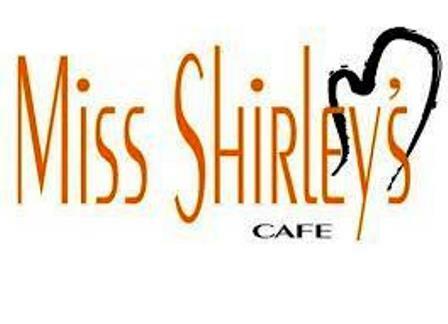 I picked Miss Shirley’s from an internet search, as I typically do from town to town for Sunday brunch. It calls itself a family-friendly place; upscale-casual; and it is. 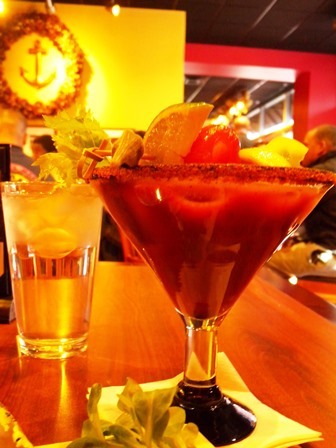 There are three restaurants in all – two in Baltimore and the one at Park Place in Annapolis; they’ve gained national press attention in the New York Times, the Boston Globe, and Food Network Magazine; they’ve won awards for Best Breakfast, Brunch, and Lunch. 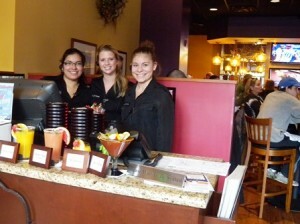 This past August they were chosen for “Best Kids’ Menu” in Best of Baltimore magazine. (Kids can select from French Toast, Mini Belgian Waffles, a Turkey and Cheese Sandwich, and Fried Chicken; crayons included.) Miss Shirley’s has been around since 2005; it was established by Eddie Dopkin as a tribute to Miss Shirley McDowell, a personal friend. Miss Shirley was a food professional, well known for her charm, and for the joy she expressed in cooking for the people she loved. That first restaurant grew, expanded; was relocated; and two more were added. So there I sat, with a menu before me that exploded with southern cuisine, presented in the funnest-sounding ways. Fried green tomatoes were served alone as appetizers or in the middle of entrees; Sandy, sitting to my right, ordered “Get Your Grits On” – jumbo blackened shrimp atop fried green tomatoes and stone-ground grits with diced bacon; a dusting of Cajun spice; the plate was a picture pretty enough to put on a Christmas card. Margo, to my left, ordered “Crab Cakes & Fried Green Tomato Eggs Benedict” – poached eggs and mini-jumbo lump crab cakes on fried green tomatoes, with roasted corn and tomato relish; asparagus on the side with Old Bay Hollandaise Sauce. Almost a year has gone by since I’ve been in a place that served Fried Green Tomatoes; I wanted mine au naturel. And grits. Remember the grits I had at the Oak Street Café in Roswell, when I was in Atlanta? They were simmered all morning in cream and served piping hot in a mug with a silver spoon. Miss Shirley’s stone-ground grits were served with diced bacon; I wanted that, and a sweet potato biscuit too. I noted on the menu they’ll serve a basket of those biscuits with Peach Jalapeno jam; or you can get cornbread with Peppadew-Jalapeno butter. Or Funky Monkey Bread – a cinnamon pull-apart filled with bananas, chocolate, and pecans and dusted with powdered sugar. Thank you for your kindness Joy! And thanks to your husband, whose name I never got. That was a magnificent gesture and appreciated more than you can fathom. How touching that someone recognized the significance of this moment to me. How fitting that her name is Joy! 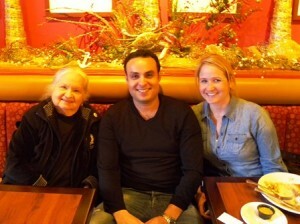 Thanks to Sandy and Elton, and Margo and Willie, who provided such good company today. 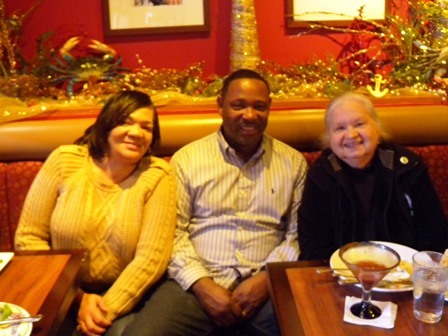 Thanks to my friendly server Laura, and thanks to Stephanie for welcoming me; thanks to Eddie Dopkin, for establishing a restaurant that oozes warmth, and charm, and thanks to Miss Shirley, who inspired it. Thanks to Gustav Brunn, who created Old Bay spices back in 1939. And thanks to the providence that led me safely all around the country, from Austin to Annapolis and 48 points between. I told you back in Albany I’d be floating on air when I reached the Journey’s end.